Jarek Janis made a huge impression during the 2006 FIA GT Championship – mainly in the Zakspeed Saleen. But after one race in the RaceAlliance Aston Martin, the last one at Dubai, he’ll remain with that team for 2007. It seems likely that RaceAlliance will race both of its DBR9s next year, but that is unconfirmed. Philipp Peter and Karl Wendlinger were regulars in #33 DBR9 throughout 2006. Tomáš Enge will extend his record of starts in major endurance races and will race at the Rolex 24 late next month. As expected, he will race for Peter Baron’s SAMAX team, in a Riley Pontiac. The Czech driver tested the car at Homestead-Miami last weekend, as already reported. Negotiations were concluded very quickly between Enge’s manager Antonín Charouz and Peter Baron. Enge will test the car again at the test days early in January. “Grand-Am is for Tomas a new series, but he knows American races and I believe that Daytona will confirm his good name,” said his manager. This agreement is just for Daytona, but other Grand-Am events haven’t been ruled out. 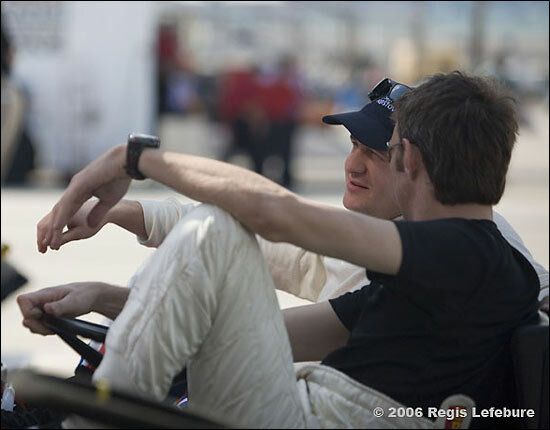 Here he is talking to Marc Goossens (who occasionally drove for SAMAX last year) at Homestead (below).